From narya_flame‘s lovely story ‘The Ways of Paradox’ set in modern St Andrews, Scotland. It’s a gentle and delightful story where Maglor meets some really engaging original characters, beautifully written with a real feel for both the Scottish setting and also daily university student life. 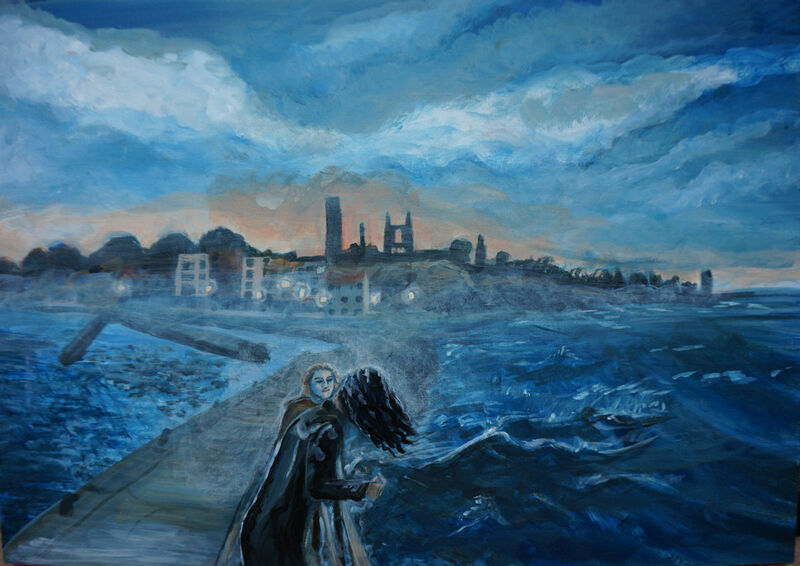 This painting is of a scene from Ch13, and shows Maglor & Claire talking at dusk at the end of the pier. I've never been to St Andrews (alas! It looks gorgeous) so I had to paint this from a collection of reference images and description. The pier is a bit more obviously on two levels than I think you've made it - a definite clamber from one to the other - but unless you've done that several times while holding a flaming torch it might not stand out to you! I tried to paint it on two levels, but it was difficult to show that clearly given where they are standing. Colin the Art thinks I should move the whole pier slightly left including the figures, and also move the figures up a bit. I may give it a go if I'm feeling brave.